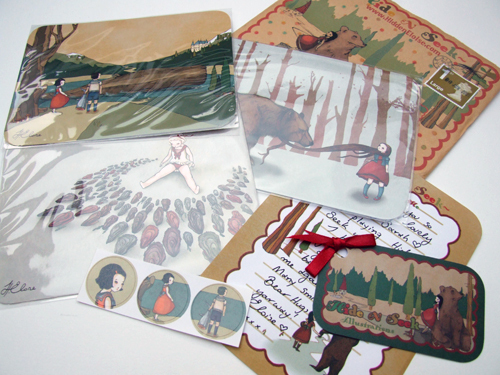 I ordered three postcards from Hide n Seek (Hidden Eloise) on Folksy on Friday and they are absolutely gorgeous. I thought I’d put them in a nice little frame and put them on the wall in my studio. I got some cute free stickers too! Can you see the envelope? It’s in the top right hand corner – it’s adorable – I almost didn’t want to open it because it looked that pretty! I would definitely recommend Hide n Seek – go and have a look at Hidden Eloise’s shop!